And ends the 2016 and proud we can say it was an amazing year. We meet the needs of our customers again, presenting features that undoubtedly improved the experience of using our application for all users. Then review the new features and enhancements that by 2016 our development team created to make Beetrack a platform capable of solving problems efficiently and in real time, always seeking to provide the necessary herramientras so that companies continue to meet deliveries and making their customers happy. May we added two new features that improved the way we work with directions and optimize routes imported into the application. 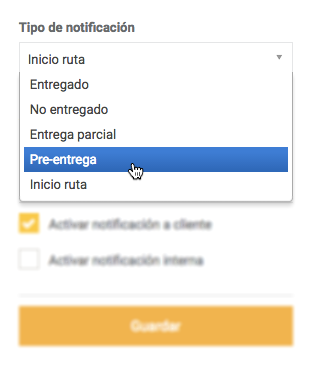 This functionality is activated in the “section Geolocation and Optmización ” in your account settings. 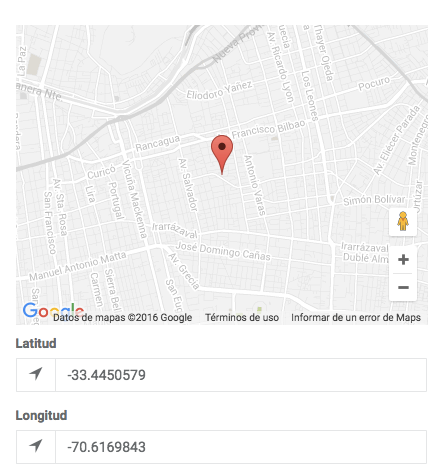 This option allows you to automatically add the latitude and longitude of clearance from the address entered in the import file. The system starts when importing process and display the results in automatically once consulted pursuant Google Maps . Read this article ! And find out how this improvement can impact your logistics operation. In July, we announced the upgrade of the reporting tool , where we added some features and improved user experience. When you enter, you will see major changes in the layout of the page. 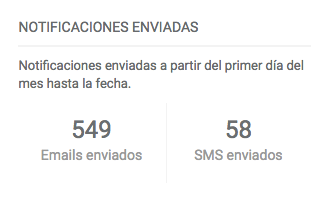 Now notifications will channel this means you have to create to be sent by email and another for SMS. 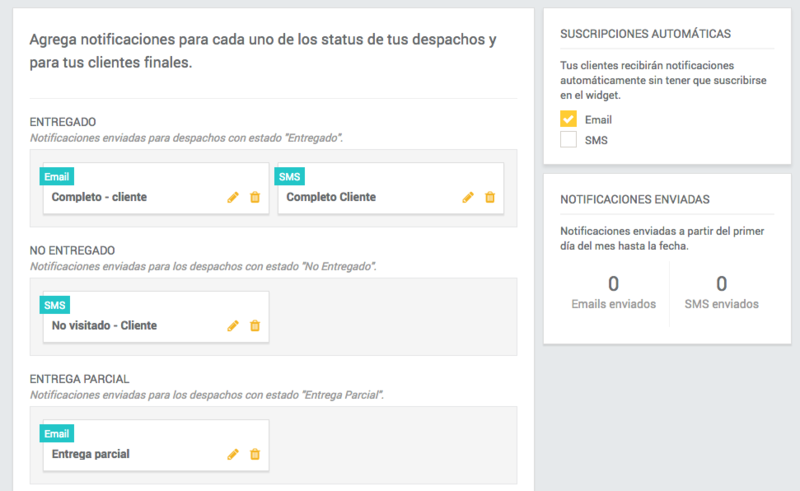 As before, you can create new notifications for each of the states and sub-states, in addition to the Pre-delivery notifications (which triggered manually from your cell phone carrier) and start the route. 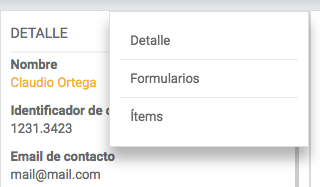 In the menubar of the main view, you can now automatically check the number of emails and SMS sent. In September we launched a heat map to have another view on the status of your shipments. We know how important it is to have relevant information about your shipments to improve logistics operation. That’s why we added a new section on statistics, where you can view a heat map to locate the frequency of your shipments geographically. On the left bar, you can filter the information by state, substate, mobile users, vehicles and compliance. In addition you can use the slider at the bottom of the map to filter by time. You can check how to vary the delivery failed not to dwell, depending on the time they occur, and optimize and adapt the times when despachas products. Learn more about this new functionality here . We create new permissions for Web users, which add authorizations so you can control in detail what they can do web users in Beetrack. We improve the layout of the data and add new options to access the data of each guide in the sight of your vehicles on the road. You can now add comments to any guide , they have a separate alert. This change is regressive, so that comments made previously will not be lost. 3-We improved interaction and usability of sight of offices and route optimization. To see the changes, go to Tours and then to the Offices of one of them. Also we improve the order of the table so you can perform actions with your information intuitively . We also add the Map button where you can see your georeferenced offices. As before, you can optimize the route when it is still not started and its offices are georeferenced . To optimize the route, press the button ” Rearrange route “. To learn more about the new features to optimize the order routing and geocoding addresses, read the following article . Now you can turn to your profile sending reports daily management . In addition pressing the button Export you can print the report or convert it to PDF. For this new next year, ramping up and have new features that will further improve shipping processes for your company, with exclusive news that will give more value to your company and above all, to your customers.